The Site Creation add-on for Restrict Content Pro allows you to offer WordPress sites to your members, using the power of WordPress multisite. This add-on requires Restrict Content Pro and a WordPress multisite installation configured for either subdomain or subdirectory sites. After installing and activating the plugin, you need to configure it for use on your site. There are several settings you need to configure to get up and running. Let's take a look at those. Success Page - The page users are redirected to after a successful subsite registration. To configure these settings, go to Restrict > Site Creation in your WordPress dashboard. In addition to the above two options, you can select any published page on your site. To use the site creation feature, you must enable it on at least one membership level. Create or edit a membership under Restrict > Subscription Levels. Select the checkbox labeled Allow Subsite Creation. 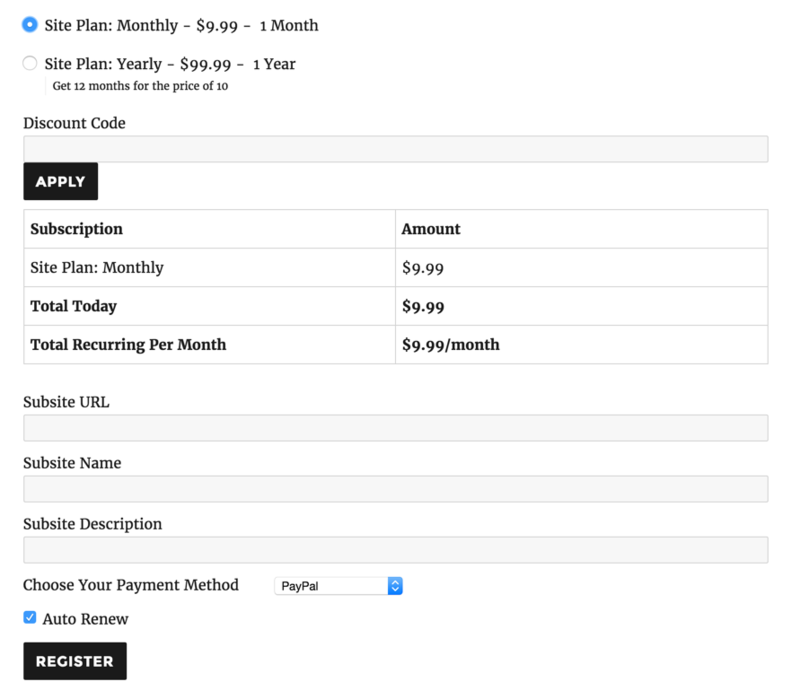 Once your membership levels are configured, you're ready to start accepting registrations for site creation. Here's how it works on the front end. When members select a plan that has Site Creation enabled, they will see fields on the registration form for entering their desired site URL, name, and description. After supplying the required information, the member will see a preview of their site URL. See the example image below. Once registration is successfully completed, the member's site will be created and they will now have administrator access to their new subsite, and only their subsite. What happens when a membership expires? 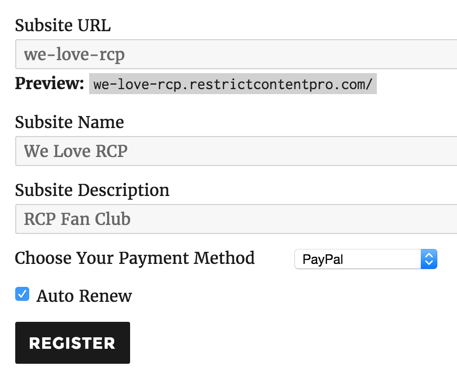 When a member's subscription expires, the site associated with that account is marked for deletion in the WordPress multisite network dashboard. The site and all of its content will be inaccessible and unavailable for viewing. When the member renews the subscription, the site will be made active again and all of its content will be available. Specify which plugins should be auto activated when a new site is registered. Mass activate or deactivate plugins across the whole network with one click. Prevent sub-sites from activating a specific plugin at all (but you can override this for individual sites).